New Democracy leader Kyriakos Mitsotakis on Sunday called for the departure of "the worst government the country has ever known." 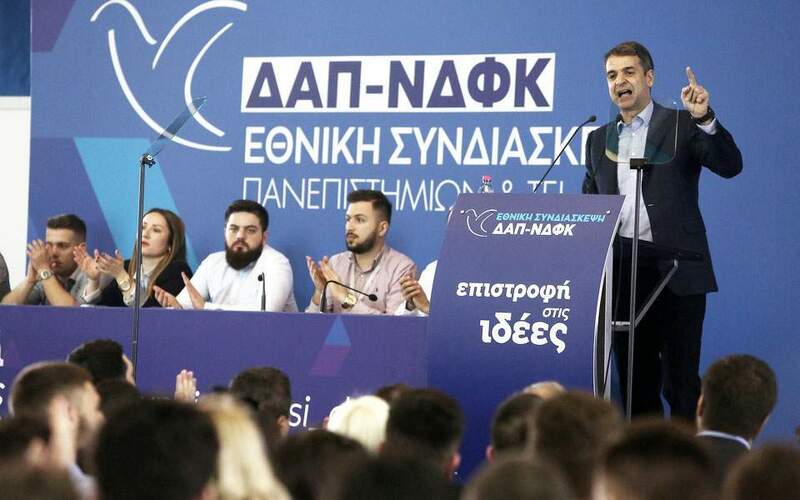 In a speech before a convention of ND's youth chapter, Mitsotakis said the leftist-led government of Prime Minister Alexis Tsipras should leave without delay "so that our country can eventually become a normal European country." "Young people believed Mr Tsipras because he told them he would tear up the memorandums," Mitsotakis said, noting that the leftist leader had promised to increase the minimum wage and "as if by magic to make unemployment disappear." Noting that Tsipras eventually did "exactly the opposite of what he promised," Mitsotakis called on Greek young people to punish the leftist leader. "He defied your dreams and your expectations," he said. Mitsotakis also blamed the government for making concessions in United Nations-mediated negotiations between Greece and the Former Yugoslav Republic of Macedonia on the latter's name, and on its ambiguous stance on the two Greek soldiers being detained by Turkish authorities after accidentally crossing the border. He said a ND-led government would crack down on lawlessness including a spate of vandalism and violence in Greek universities.